The electricity used to power daily activities is still primarily generated from fossil fuels. This kind of power generation pollutes the environment because of high CO2 emission rates. Moreover, fossil fuels are finite - and once used, are gone forever. For this reason alone, alternative forms of renewable power generation provide a more intelligent solution towards powering human lives. Photovoltaic systems provide energy to meet society's needs without contributing to the greenhouse effect and are a genuine alternative to conventional energy generation. Photovoltaic systems are considered to be the quintessential clean solution because they convert sunlight directly into electricity. Hence, Clover Solar plans to co-ordinate the land location, design, installation, implementation and operation of renewable energy PV solar systems for prospective generators. Clover Solar's photovoltaic installations have the potential to be the first choice energy solutions because of their clean and nearly maintenance-free operation. As a comprehensive power solutions provider, Clover Solar would also partner with investors, energy project developers, and customers to design and implement innovative green energy solutions to create a brighter, cleaner ecological future! A rooftop photovoltaic power station, or rooftop PV system, is a photovoltaic system that has its electricity-generating solar panels mounted on the rooftop of a residential or commercial building or structure. Rooftop mounted systems are small compared to ground-mounted photovoltaic power stations with capacities in the megawatt range. Rooftop PV systems on residential buildings typically feature a capacity of about 5 to 20 kilowatts (kW), while those mounted on commercial buildings often reach 100 kilowatts or more. 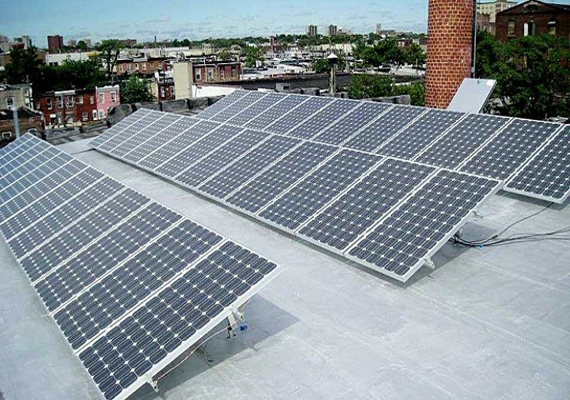 In a grid connected rooftop photovoltaic power station, the generated electricity can be sold to the servicing electric utility for use elsewhere in the grid. This arrangement provides payback for the investment of the installer. Many consumers from across the world are switching to this mechanism owing to the revenue yielded. In Maharashtra this mechanism is functional through Net Metering. Address: Clover Centrum, No 5, Galaxy Society, 245, Boat Club Road, Pune 411 001.